Dubai, United Arab Emirates - 3 July 2018. Design from a single source: Thanks to the GROHE ceramics lines Cube Ceramic, Euro Ceramic and Bau Ceramic, every bathroom now becomes a harmoniously coordinated oasis of well-being. 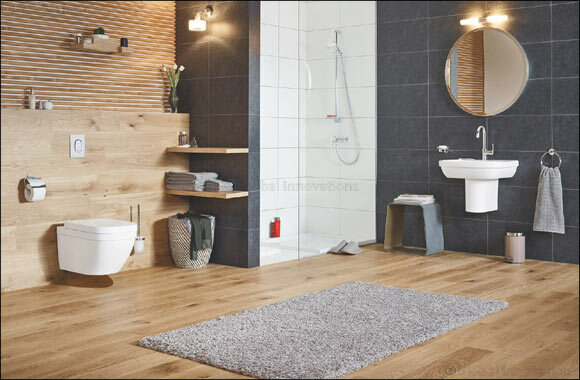 From washbasins in different sizes to bidets and toilets, GROHE offers a comprehensive assortment of bathroom ceramics that will suit every style and perfectly match GROHE faucets, toilet flush plates and accessories. With these fully integrated solutions, the world's leading provider of sanitary fittings and full-service supplier simplifies the search for the PerfectMatch in the bathroom, drawing on LIXIL's decades of know-how in this category. Thanks to innovative technologies, GROHE ceramics are characterised by maximum hygiene, longevity and comfort – an excellent combination of form and function. With its angularly shaped and minimalist design, the ceramic line Cube Ceramic transforms every bathroom into an urban place of relaxation. The washbasins, toilets and bidets with clean lines and right angles match the geometric faucets of the Eurocube, Linear, Allure and Allure Brilliant lines, the Skate Cosmopolitan toilet flush plates and the Selection Cube accessories. Featuring a look of contemporary forms inspired by Cubism, this ceramic line creates a luxurious retreat in everyday life. Cube Ceramic washbasins are available as extra-wide models and chic wash bowls. In addition, the line offers a hand basin with a shallower depth. The toilets are available in either wall-mounted or floor-standing styles – always with perfectly balanced proportions to the seat.